Despite its potentially nocebic name, Sever’s Disease (which is also know as calcaneal apophysitis, or Sever’s Lesion), is in common terms a fairly common painful heel bone disorder in children, particularly those that are physically active. It is often likened to its knee equivalent, Osgood Schlatters, but is often misdiagnosed as plantar fasciitis. It most commonly occurs during the growth spurt of adolescence; the (roughly) 2-year period of early puberty when children grow most rapidly. This growth spurt can begin any time between the ages of 10 and 15 for boys and 8 and 13 for girls. Once children reach 15 years of age, the growth plate hardens and the growing bones fuse together into mature bone, making Sever’s Disease much less likely. So what causes SD? During the growth spurt of early puberty, the heel bone sometimes grows faster than the leg muscles and tendons. This can cause the muscles and tendons to become very tight and overstretched, making the heel less flexible and putting pressure on the growth plate. The Achilles tendon is the strongest tendon that attaches to the growth plate in the heel. 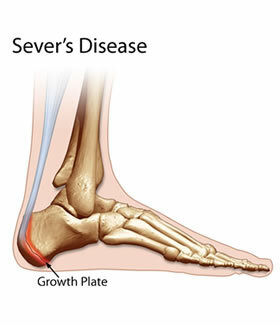 Over time, repeated stress (force or pressure) on the already tight Achilles tendon can damage the growth plate, causing the above symptoms of Sever’s disease. High impact sports are often associated with SD – such as running, netball, gymnastics, football. Once diagnosis is confirmed (and rarely are scans needed to do this), the initial aim of treatment is pain management. The P.O.L.I.C.E protocol is useful, but as the condition can persist for up to 2 years, ideally a structured, graded rehabilitation procedure of strengthening and stretching the relevant tissues will be discussed, with (potentially) a return-to-play plan put in place. N.B. There are no ‘one size fits all’ style quick fixes in most injury scenarios, so these article shouldn’t be seen as such. They are merely guides to a better understanding of how our bodies work. This entry was posted in Uncategorized on 9th November 2017 by DCInjuryClinic. Keep up to date with the latest offers, blogs, workshop dates, competitions, research, rehab. videos and advice all in one place! Wordpress Design & Hosting by Cottage Industry Solutions Ltd.